RUSH: We go back to the phones now in Memphis. Terry, great to have you with us on the EIB Network. Hello. CALLER: Yes, sir. How are you doing today, Rush? RUSH: Just fine. Thank you. CALLER: It’s a pleasure and honor to talk to you, I’m a first-time caller and I’m a long, longtime listener. RUSH: Great to have you out there. I’ve been doing this a long time myself, so I know right where you are. CALLER: Well, I got a question for you, and my question is, do you really think there’s a chance that Jeff Sessions would fire Andrew McCabe before this weekend. RUSH: I want to play an audio sound bite. You hang on. We’re gonna listen to this together. I made a point yesterday. I said, how ironic is this. Here we’ve got McCabe and he’s worried about losing his pension. What about Michael Flynn? They’re gonna put him in jail! They’re gonna put him in jail, he’s lost his house. He’s lost his entire life’s work in order to pay legal fees for lying when the FBI doesn’t even think that he lied. The guy has had to sell his house. He’s had to give up the fight because he can’t afford it, and here we are worried about whether McCabe is gonna get his pension? What’s wrong? And guess what where that showed up? 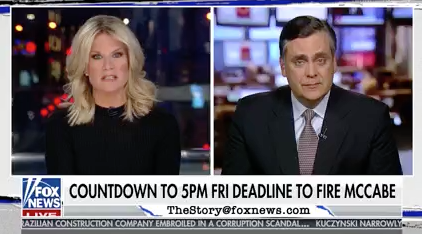 Last night, Fox News Channel, The Story with Martha MacCallum, here’s Jonathan Turley. TURLEY: The real strange thing about all this is that McCabe so far has been worried more about pensions than prison. That’s not the choice that was given to Michael Flynn. Michael Flynn, if you recall, was charged with false statements even though Comey’s investigators reportedly believed that Flynn didn’t intend to mislead them. That’s not apparently the conclusion of the inspector general with regard to McCabe. RUSH: So I’m gonna tell you, Terry, we’re living in the Twilight Zone. None of this makes any sense. There is no reason that — Michael Flynn has done nothing ever but defend, protect, and serve his country. He made the mistake of being an early Trump endorser and he got snared in that FISA spying of the Russian ambassador. If I had to guess, Sessions will not fire McCabe, on the basis that it would be cruel to deny this valiant public servant his pension. I just can’t see it. It has to happen today, right? It has to happen before Sunday, correct? RUSH: You don’t think so, either? CALLER: No, sir. No, sir,. I sure don’t. Well, Rush, you have a good day and it was a pleasure talking to you. RUSH: Same here. I’m glad you called. I have never thought Sessions would fire the guy. But, folks, I’m getting to the point where I really don’t believe jack. And it’s hard. The instinct is you react to what you hear, “Oh, look at this.” You accept it, you digest it. It takes an active effort to question everything that is reported as fact in media today. But I can’t see it. I can’t. We do not have warriors in the Department of Justice like they do when they run it. RUSH: Boca Raton, Florida. Tim, it’s great to have you. How you doing? CALLER: Good. Thank you. Happy St. Patrick’s Day one day early. RUSH: Yes, sir. Tip the glasses already. Get started. CALLER: That’s right. I was wondering, back to the Mueller investigation, being this thing was basically started on a bunch of fraudulent BS, does Sessions have the authority to unrecuse himself? CALLER: That’s what I was gonna ask, does he have the guts to do it? RUSH: Well, I don’t know if it’s guts, or more would be protocol and propriety and it’s something that probably isn’t done very often, but I think — I’ll have to double-check, but I think he could. CALLER: Do you think, like, when the IG report comes out, if it’s gonna be as damning as people say it might be? Do you think he’d change his mind at that point? 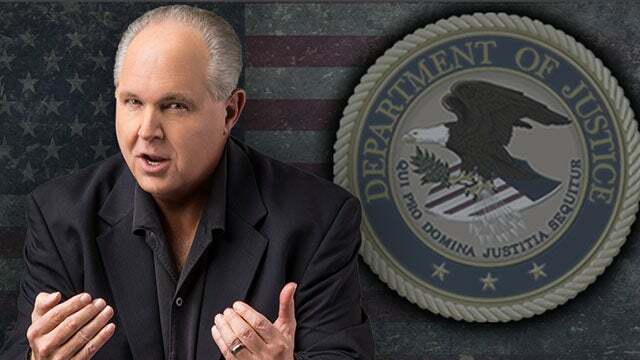 RUSH: The best answer I can give you to that is that I don’t believe what I hear about this stuff. I’m not gonna get all ramped up and think this is gonna be a grand-slam home run and end up being disappointed what I find out we’ve been misled. So I don’t even think we need the IG report. I hope it’s what we think it’s gonna be, and I hope it is honest and is filled with legitimate criticisms and examples of the abuses of power that have gone on in there. I do hope that’s what it — ’cause this needs to rooted out. This stuff needs to be cleaned up. There are just too many people who do not trust what’s coming out of the nation’s capital on anything. That’s not good. That can’t stand. That has got to change.